Lençóis is (supposed to be) a 6 hour bus ride from Salvador, located in the “interior” wooded landscapes of Brazil. the town is now supported by tourism and treking but was first built to support the diamond miners in the area. it was made into a national park and mining is not supposed to occur. people still search for diamonds in the rivers but don´t destroy the land like they used to. i´ve seen some of these natural diamonds before they are cut and they are AMAZING. i would like to try to buy one before i go. my feet are tattered and torn. they are like beaten mules. after a three day trek, i am just happy to not be on crutches. i´ve compared my feet with a local friend here. mine are sun burned on top, blistered, calloused and cracking. it´s not a pretty site. his are like slippers. i don´t get it. he scales rough rocky waterfalls barefoot better then i can walk in a straight line and his feet are soft like pillows. i had expected they´d be more like shoe soles. in general though, the people here are perfect images of physical health. for a city with not much man made entertainment, there is an abundance of natural landforms. and capaiera, which the kids start at a very young age. we´ve been treated to some amazing performances. the children are flashes of arms and legs, little ninjas. and the adults are super human. when they finish you realize your heart is beating because you haven´t taken a breath from the moment they flip or cartwheel into the ring. they are double jointed and have a gymnast´s command of their muscles. so our friend Dan acted as tourguide our first couple days here. he worked in Lençóis for two months. his friends took us in and have been treating us to the local fun. the heat during the day necessitates trekking out to one of the nearby watering holes. we get up, have an açai with granola and banana, trek out. lay in the sun. swim. on the way back you might stop at a concession for a drink and game of dominoes. at night you just walk around the loop. there´s a well worn route through town where people just cruise all night, stopping here or there for a cachaça or simple sandwhich or tapioca crepe… there´s no need to make plans with people cause you´ll run into them at some point. and you all end up at the reggae bar. then out to see the stars and overlook the city. i wish i could include all the little details here. everything that makes an impression on me. we´ve laughed a lot and wondered a lot… i don´t think of these things while i am sitting here at the computer, but they make me smile when i remember them. on the trek andrea noted that if there were a contest for the strangest travel bag collection i would win it. i travel with a banjo case full of clothing and banjo, a bike bag, a green sack that is supposed to be for a sleeping bag, a gym bag, and a tattered pick tote. for the trek i had two bookbags stacked on top of each other and a sleeping roll sandwiched between the two. eh. travel with the banjo and gym bag primarily has been tough but there are times i really crave playing. so it´s been worth it. the other day andrea and i had a sit around and play banjo, practice Portuguese day. i love learning another language. my spanish is so-so. my portuguese is so-so… it´s just fun. i will continue to work at it, but talking with people is really the best way. we discovered that kids are fantastic teachers. patient and they don´t act surprised if you don´t know something. they just find a simple way to explain it. got to hit the road. i´ll be back. oh, one quick thing. our bank accounts were emptied by someone in Salvador. not fun. but we´re dealing. my mom likes to point out that this is the 6th or so theft that we or someone we know has experienced. she does this with a laugh. 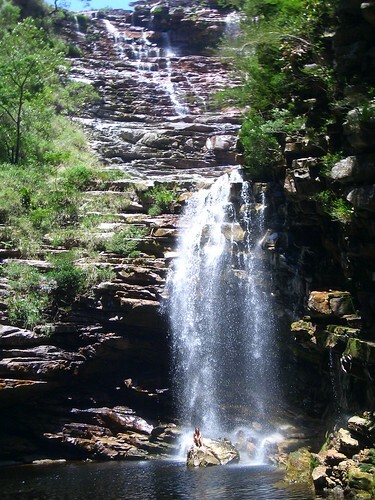 sounds like a lovely vacation…i want to frolik in waterfalls! we got snow this past weekend. in an unrelated topic, can you see this comet?